Topographical survey is used for identifying and mapping the contours or outlines of the earth's surface and its other features, slightly, above and below of it. Topographical land surveyor creates a 2D/3D Image of vertical and horizontal position of points and the distance and angles between them. By Conducting a Topographical survey, you can locate the alignment for pipelines, roads, transmission lines and canals etc. Topographic map is most often delivered as contours which are 2D isolines that depict the 3D shape of the Earth’s surface at a given location. 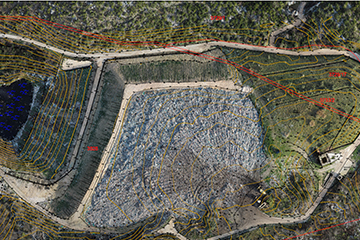 These contours are used to calculate metrics such as slope, water flow, cost estimates, cut and fill (dirt to be moved from where to where), locations of undulations or hazards in the existing surface and volumes of material. When it comes to topographic mapping, unmanned aerial vehicles (UAVs) have filled an efficiency gap in the geospatial toolbox between when it makes the most sense to use terrestrial methods such as RTK GNSS, total stations and laser scanners and certainly it makes sense to hire a manned aerial mapping service or order satellite imagery for a project. well that's a bit of discussion about static surveying, but as you know, a good deal of GPS these days is done not static. Much work is now done with DGPS, RTK survey in India. 3D modeling- 3D models are a great way to visualize the area of interest, 3D modelling is the process of developing a mathematical representation of any surface of an object (either inanimate or living) in three dimensions via specialized software. Here are offering 3D modelling services for viewing or engineering analysis, to make them more competent development process. DSM- Drones are flown over areas of interest to acquire aerial data. This information only brings value to the end-user once processed into a usable product. In the case of imagery, we use a complete photogrammetry workflow to generate an accurate DSM (Digital Surface Model). DSM represents the MSL elevations of the reflective surfaces of trees, buildings, and other features elevated above the “Bare Earth”. DTM Elevation- A DTM is known as digital terrain model which is effectively a DEM (Digital Elevation Model) that has been augmented by elements such as break lines and observations other than the original data to correct for artifacts produced by using only the original data. DGPS, RTK survey in India- DGPS stands for Dual frequency Global positioning system and Real Time Kinematic (RTK) satellite route is a system used to improve the accuracy of position data derived from satellite-based positioning systems such as GPS. Our company excels in providing DGPS, RTK survey to the clients which is highly demanded in institutional research. This service is rendered by our well experienced professionals who holds rich knowledge of this domain.